Another long-time employee of the City of Rising Sun is stepping out of public service and into retirement. After 39 years, Rising Sun Police Sergeant Frank McIntosh is turning in his badge. 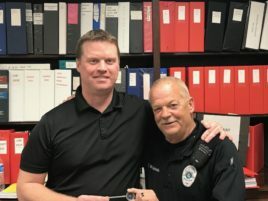 His final day work day on the job was March 28 and, at that time, was presented a key to the city by Mayor Brent Bascom. McIntosh will continue to assist the RSPD until his official retirement date of July 1. McIntosh has been a major asset to the Rising Sun Police Department for nearly four decades and has served our community under 10 different mayors. Please join us at City Hall (200 N. Walnut St.) on Thursday, April 25 from 1 to 3 pm for an open house in his honor. For our departing Sergeant McIntosh, stop by and say thanks for his years of hard work and dedication. For our lifetime friend and neighbor Frank, offer your congratulations and well wishes as he begins a new chapter of his life.